Donna Belt https://www.review-australia.com/au/donna-belt-black/RE18ACC045.REBLK001.html Classic yet feminine, the Donna Belt in Black is a wardrobe staple for the fashionably accessorised. It features a pin buckle fastening with a single keeper. The metal love heart and Review branding offer feminine touches. Wear with any outfit for a cohesive look. 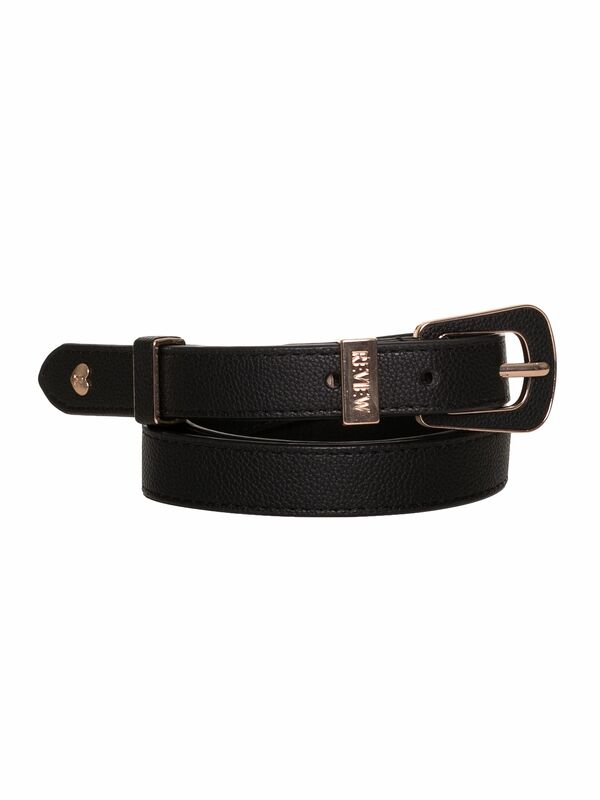 Classic yet feminine, the Donna Belt in Black is a wardrobe staple for the fashionably accessorised. It features a pin buckle fastening with a single keeper. The metal love heart and Review branding offer feminine touches. Wear with any outfit for a cohesive look. Donna Belt is rated 4.8 out of 5 by 43. Rated 5 out of 5 by Joyful from Classy and eye-catching belts! I used my voucher to purchase this belt in the light pink and red. These fit nicely and are incredibly classy as well as eye-catching. I think they'll be a great finishing touch to a number of dresses I own so can't wait to wear it! Also the pale pink is a very rare shade to find in terms of a waist belt so I'm very happy with my purchase. Rated 5 out of 5 by Bettz8 from Great quality I had looked around for belts for a quite a while and never found the right one so took a chance on this - I bought the red and then the black! Because they are such great quality they are a statement belt that is subtle glamour. Great fit around the waist, the medium was good for me 10-12 size. Rated 4 out of 5 by Elki123 from Versatile belt I have this belt in another colour, so happy with the overall style. The quality is good, considering they’re not made of leather. The belts have never peeled, and wear well over time. I have found the end piece that slides through the stopper is a tight squeeze on my newest belt. Rated 5 out of 5 by Lisa Jane from Superior belts with a touch of added class I love the Donna belts so much I have them in all the available colours. They're a far more superior quality than the standard belts that the dresses come with, yet are the same simple design with just a touch of added class with the metal. Rated 5 out of 5 by Ktandp from Smart looking belt I bought yet another black belt because none of them are ever quite right... this belt is very close to being perfect! The right width - approx 2cm wide - and is just smart. Not too much of a statement which is what I was hoping for. Rated 5 out of 5 by AliKaye from Fantastic! A well made belt with lovely detail! I am a size 8 and intended to wear this with the Review Smartie Pants. I actually need the large size to fit around my hips! So maybe go up a size if you intend to use the belt around your hips!